Tubapede Records announces it's second release, The Shortening of the Way, a solo album by New York bassist Tom Blancarte. 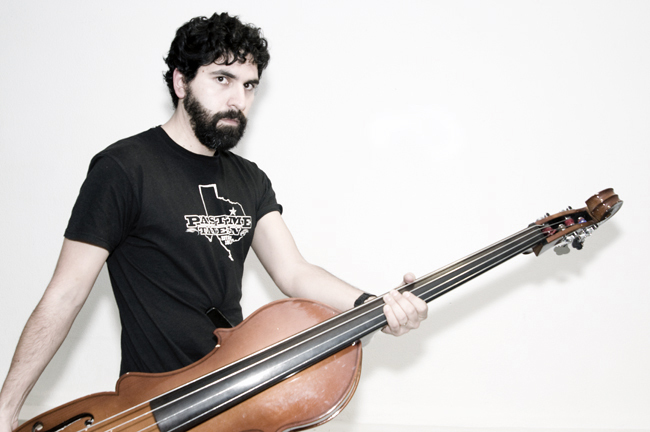 For nearly a decade, bassist Tom Blancarte has been contributing a vivid pallet of dark frequencies to New York's creative music scene. A native of Austin, Texas, his formative years included a steady diet of fantasy and sci-fi novels and video games, and later on a total immersion in death and black metal. Accordingly, Blancarte has cultivated a demented and visceral instrumental practice that transcends the experimental bass canon and pushes improvisatory art to new extremes. Tom announces his debut as a solo artist with The Shortening of the Way, a bold new release on Dan Peck's Tubapede Records label. After years of holding down the low end with a number of avant-garde groups (such as Peter Evans' Quintet, Seabrook Power Plant, Totem, The Home of Easy Credit, and The Gate), Blancarte pushes his way to the fore with a contrasting album of beauty and sonic exploration. The LP jacket features photography by Tom's father, Gilbert Blancarte, and quotations from science fiction author Frank Herbert and anti-civilization blogger Ran Prieur. "Blancarte is a man pounding strings, slapping the neck of his instrument, crawling between the thick strings with sticks, the bow producing drones that make the ears tremble with joy. He is an improvising proletarian hero, a man who does not seem thoughtful and puzzled while playing, but rather a working man who enthusiastically performs hard labor. Sweat, effort, hard work, these are the elements of his expression, and we salute them." "...prosperous in fantasies and toughness..."
"...in moments of heightened tension it sometimes sounds like he will thrash the strings right off the face of the bass, but his range extends to the contrastingly plangent."